A vinaigrette is made by creating an emulsion using oil and something acidic. 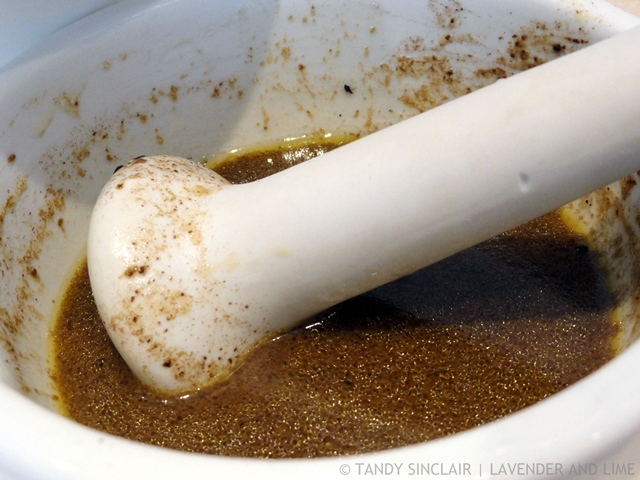 My black garlic vinaigrette uses lemon juice yet has the hint of flavour of balsamic vinegar. This comes from the garlic. Use as a salad dressing or marinade. Fifteen working days before we left for overseas my laptop hard drive gave me a warning all was not well. But, Dave seemed to have fixed it and the first thing I did was back up my documents. My intention was to take it to the computer guru we use while we were away and let him sort it out then. But, five days later it gave up the ghost completely. Dave’s magic had not worked and my back up did not include my emails, or the last weeks’ worth of work. That did not bother me too much as I could easily catch up on the financial work that needed my attention. And as for the documents, the ones I really need are stored on another computer as well as my own. As for the emails I don’t have I shall have to just ask people to resend the information I discover is necessary. The positive to take from this is I have really decluttered! The negative is that my One Drive did not upload my photographs and whatever recipes I had made since my last backup all have to be redone. 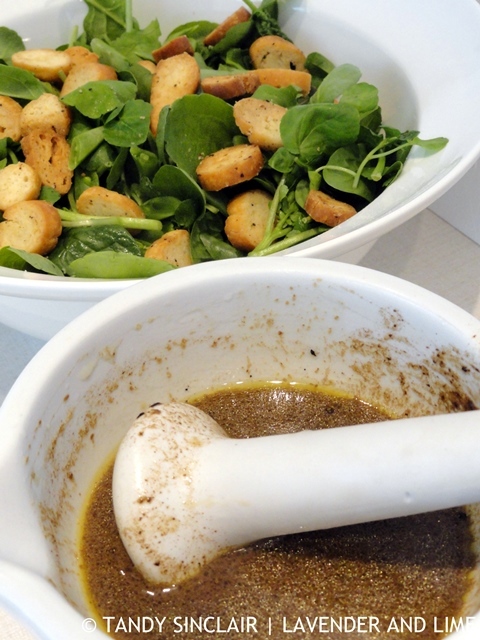 I loved this black garlic vinaigrette so much that it was not a bother to remake it. It is perfect with bitter greens like I have used here. What a positive outlook, I would freak. And a good excuse to remake delicious recipes. I have yet to play with black garlic. It is a good excuse, but I have done nothing since then! I think this post is a lesson for us all Tandy. I am also slack about naming photos for the blog, only do so when I need them. Consequently, when I need something in a hurry, I can never lay my finger on it. I love the idea of your vinaigrette and will give it a go when I next have black garlic in the kitchen. I have fallen behind again on this task! I have never seen black garlic. Black garlic vinaigrette? Wow! That sounds divine. I have never heard of black garlic before, but I just love garlic so I can tell I will love this. Nothing me stressful to me than computer mysteries. However, everything happens for a reason and de-cluttering may have been it. What a delicious, tangy vinaigrette. I agree, the decluttering was good! Tell me more about the black garlic you used, please Tandy. How smart to have backed up most of your data, I’m afraid I am lacking in that department, good reminder for me to get on the ball. Love this vinaigrette Tandy. Hope you have done a back up Cheri! Well, my husband believe it or not is the vinaigrette maker of the household. It is his speciality so I will have to get him on this! I’m just not sure what black garlic is and how to acquire. Although I do have lots of fresh garlic this year I have been enjoying. It’s nice when you have a recipe that has multiple purposes! Sounds divine! I can’t believe how expensive anchovy’s have become. Oh what a nuisance about your hard drive! But yay for decluttering. I keep seeing black garlic but haven’t bought it-yet! Lovely dressing! I feel your pain re the laptop… a similar thing happened to me too recently ?